Golf is a game for gentlemen which follows an appropriate etiquette carefully maintained by traditions that managed to have almost no changes ever since the game was invented. The rules of this classic sport include good manners, respect and equality between all players whether it is a partner or rival as well as maintenance of order in the field. Today, the golf is a huge industry, bringing enormous profit staring from creating space for playing to equipment. The cost of all necessities for the game, people buy is estimated to be more than 10 billion dollars a year. Since the sport is quite consuming in terms of expenditures, millions of rich as well as not very rich players, and enthusiasts of this sport think how to make it more dynamic and attract new fans. One of the most used tool in golf is the rangefinder. The Bushnell, the leader in the golf market has created its product, Bushnell Tour V4 JOLT Golf Laser Rangefinder in 2016. The rangefinder is a very useful tool for selecting the stick and type of impact more accurately thanks to the relief function taking into account the position of the ball and tells the person how high or low the flag is. During the game, the use of a rangefinder is allowed, so the player has the opportunity to know the distance from the ball to the hole, but without taking into account the terrain. Approved by US Golf Association, the Bushnell Tour V4 JOLT Golf Laser Rangefinder has an interesting design unique design starting from the package ending with product itself. The package has a clip that is easy to attach to the golf bag. The rangefinder itself has a rough texture for gripping in places where fingers are placed to make sure the player can hold it stably. Manufactured specifically for golf players, its weight is less than 200 grams. Due to different circumstances of the game in order to escape major breakdowns, the tool is made waterproof and has an ergonomic packaging. With the size of 40x71x107 mm, that can fit perfectly in a palm of a hand, it is super compact and comfortable to carry around. The company implemented the JOLT Rangefinder technology and used it for past couple of years on all its products. This is an interesting feature for a product such as JOLT Golf Laser Rangefinder since it can provide the player with an information whether it has locked onto the flag or not. Such a technique makes the calculations and estimations precise. The golfer is being able to score without searching for background targets, which without a doubt lead to a better performance of the game. The tool can measure the distance in meters and yards. Such an option is very useful since each country uses a different unit of measurements. The abbreviations are used as Y and M for better understanding, which can be easily selected at the lower right portion of the screen. When one option is selected, the other will switch off. Bushnell Tour V4 JOLT Golf Laser Rangefinder’s ranging accuracy is between +/-1 meter with a range from 4 to 900 meters to a flag within one meter, which can be considered as one of the main competitive advantages. The usual maximum distance is around 600 meters, but if the object is quite reflective, the range can increase up to 900 meters. Of course, everything depends on how reflective is the aim, the conditions of the weather since even a little wind can change the accuracy as well as the time when the object was measured. The other part about the product is 5x eyepiece and a fast focus System that lets a player view the shot perfectly well for 10 consecutive seconds and even though it can be longer, the company asks to not look at the aim for too long with magnification as it can damage the eyesight of the golfer. In fact, the eyepiece can be adjusted with +/- 3 diopter arrangement which obviously helps to focus on the target according you your sight. TOUR V4 Slope Edition is also a feature, which is responsible for all Bushnell models, is responsible to finding the right range for angle compensation based on the slope and the distance that the rangefinder calculates on its own. Such thing helps to plan out the shot and makes it easier on the player. With the objective diameter 20 mm and multi-coated optical coating, it is easy to use the tool. Finally, yet importantly, the Bushnell Tour V4 JOLT Golf Laser Rangefinder is working with CR-2 3-volt lithium battery, which needs to be replaced depending on the time of the usage. The tool will have a sign “i08” once the battery goes low, so the golfer will know immediately it is time to change them. The packaging as mentioned before is unique and already includes the battery inside, so the golfer can go and straight away enjoy the experience of playing. In case of some technical problems, the customer has 2 years warranty on the product. Overall, the golf is designed to develop an intellect, maintain a physical and psychological health as well as beginning of a successful career. This sport has its own atmosphere where all the players are involved in process. People who start to play notice a significant change in attitude, well-being and surroundings. Such a situation arises due to player’s aim to move forward as if the little ball is his life. This is the reason why golf is one the most joyful game and many people love to observe it. So, why not to enjoy the game with the best equipment someone can possibly get? While many other companies are still on the verge producing something authentic, Bushnell is doing it at this right moment. Of course, since the model was introduced, many other models came to the market since then, like Pro X2 from the same company as another innovation of 2017. It became a bestseller of the year due to two displays, which allowed players to choose a red or black display, depending on what is more visible in the current conditions. However, the price is one and a half times bigger. In fact, the company has already proved a good quality for an affordable price. All of their products had no issues with clients and have one of the best ratings. 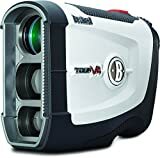 For the price of 275 dollars, the Bushnell Tour V4 JOLT Golf laser Rangefinder is a real dime for golf player, which cannot wait to be used.